As a nation we have long recognised the importance of green spaces in the health and happiness of communities and individuals living within them. 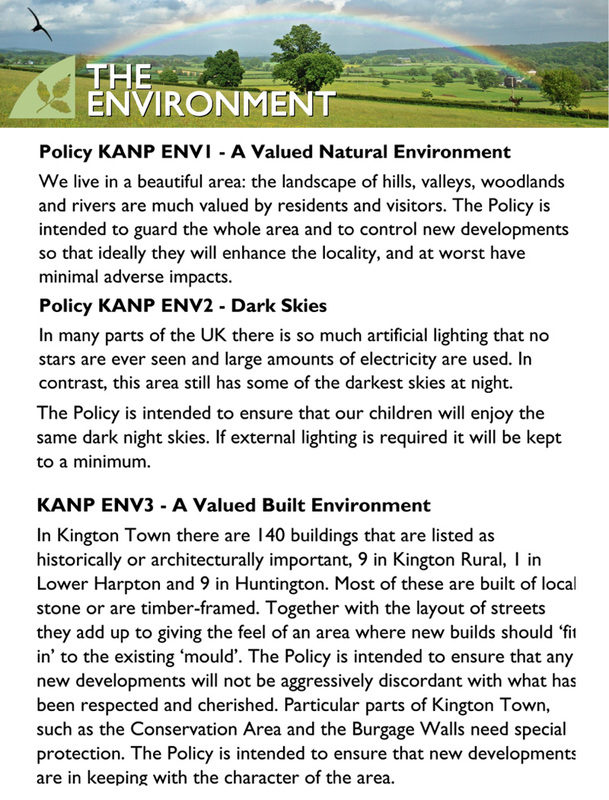 Over many years the nation has designated areas and features as being of special value to us e.g. 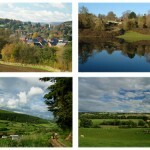 National Parks, nature reserves, common land and historic landscapes. 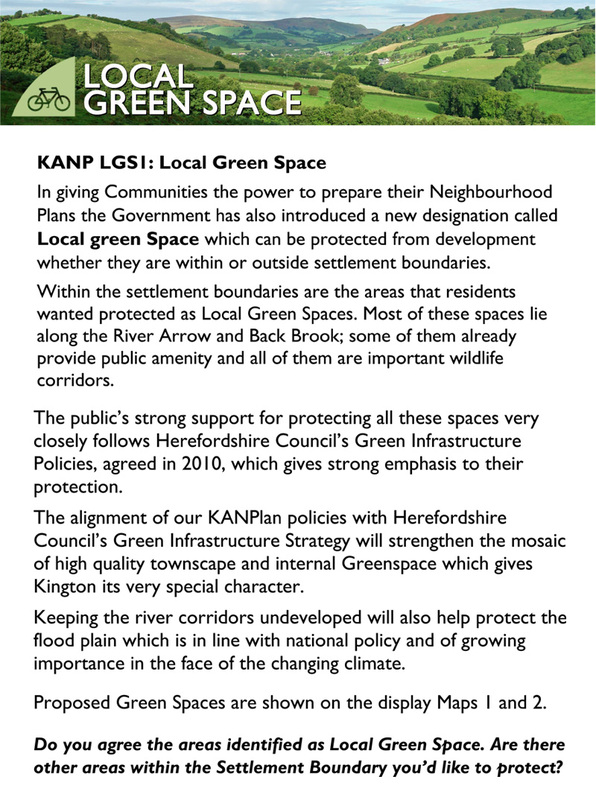 In our Neighbourhood Plan we can identify and protect Local Green Space. It might seem unusual to be considering this when we are surrounded by open countryside and farmland. Sizeable areas like Bradnor Hill and Hergest Ridge are entirely accessible commons and others like the recreation ground in Kington, are already public open space. However, there are many other local areas that we might like better access to immediately around us. These would benefit from being identified and better protected. 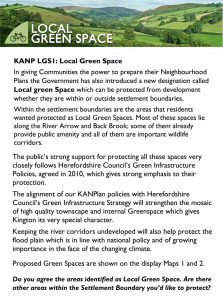 Through the Neighbourhood Plan, we can decide on which are our important green spaces, places that we should protect and be allowed to enjoy, and ensure they will not be given over to other uses in the future. Where should our Green Spaces be? Is it in reasonably close proximity to the community it serves? Is it demonstrably special to the local community and does it hold a particular local significance? Are there significant views from the local area into or across the site? Does the site afford the community or public with significant views out into the wider countryside? Does the site have special historic significance or features? Does the site have recreational value? Is the site particularly tranquil? Does the site have ecological value, trees, wildlife or habitat? 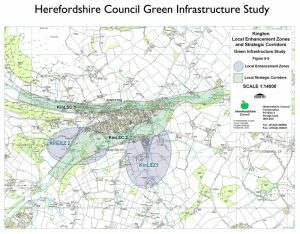 Does the site form a significant green break within the town, settlement or an agricultural development? Are there other reasons that make the site special to the local community? Is there evidence demonstrating that the site is special to the local community? Is the green area local in character? 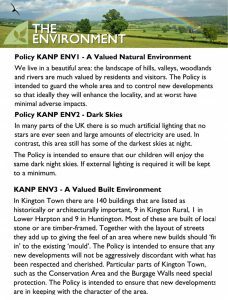 The Kington and Huntington Surveys have provided some information about places you thought should be allocated as Green Space and the Neighbourhood Planning process will offer more opportunities to receive ideas and make additions. We want everyone involved in recording the importance of Green Spaces to help answer the questions above and to help us identify and enjoy our Green Spaces into the future. 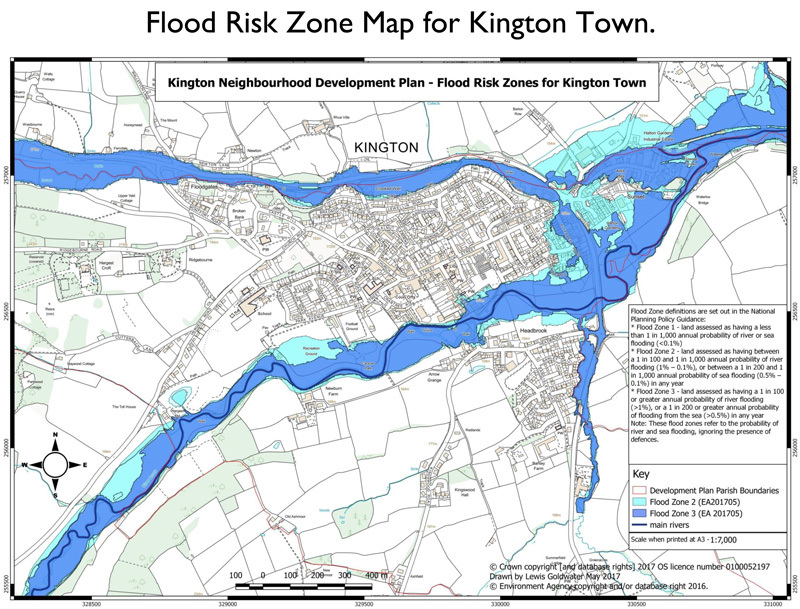 Kington Town Centre is shaped like a sump. Several alleyways lead down into the High St. and they are tarmaced over. A lot of the fairly new houses higher up behind the High St. have tarmac and paving so that should there be very heavy rain all the water would come down into the town centre, so areas where rain can drain away are vital. The Headbrook side of these fields is used for grazing. Would it be possible for this area to become a real public park? Not a football ground…we have that already or a play area like Crooked Well but a real park with trees ( water greedy ones that could cope with extra rain fall) and shrubs, maybe a café or people could buy a takeaway at Sally’s Bakery and eat it in the park. Better still would be a real Nature Reserve or a community orchard but any of these ideas would hopefully be dog free. If the condition of streets and buildings is within the current remit, then I suggest the following. Pavement surfaces are generally unsightly and some dangerous. Improvement here would make a big difference to overall Street appearance. This could be done in small stages as money, grants, become available. Isolated buildings and other elements are suffering from neglect and lack of maintenance in all the main Streets. Could the town council offer small grants to encourage people? Perhaps starting with some form of pilot scheme? I am sure there would also be unemployed people in the town who would be prepared to help. Owners of listed buildings have a responsibility in law to maintain their buildings and structures. The town council with local knowledge of ownership could politely write to one or two of the offenders? 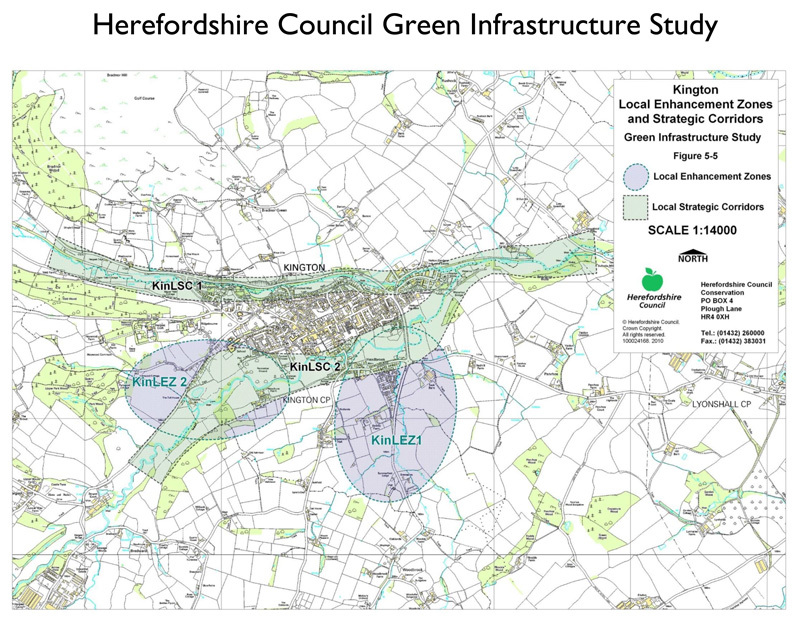 They might also liaise with Hereford planning( listed buildings) in significant cases.